Far Yeast Imperial Peach is a 7% fruit beer, based on a Belgian tripel, from Far Yeast Brewing Company, based in Yamanashi, Japan. It’s part of their collaborative series, with this one being done with Brouwerij de Prael, a brewery based in the Netherlands. Far Yeast Imperial Peach uses locally sourced peach juice during fermentation. Far Yeast Imperial Peach poured out a hazy brownish orange colour with a massive fluffy white head on top. The head collapsed on itself, leaving some bubbles attached to the side of the glass. It had a strong peach aroma coming off it, with some sweet caramel notes just following through as well. There was a faint Belgian yeast funk going on, as seems to be the case with all the beers from Far Yeast Brewing so be warned. The body was more of the same with lashings of sweet peach flavours coming through and a slight sour twang too. Maybe it was deliberate or not? Far Yeast Imperial Peach also had some fruity flavours coming through and a subtle yeasty kick too. The main down point to Far Yeast Imperial Peach was that the carbonation was quite high which meant this beer was not a quick, nor easy, drinking beer. 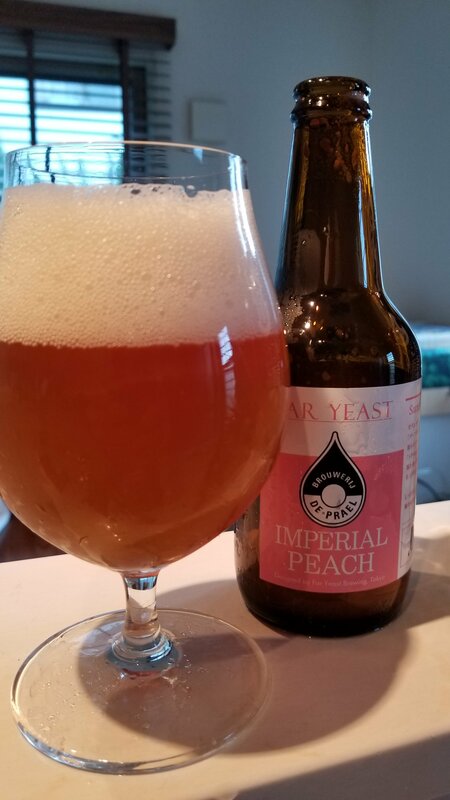 Far Yeast Imperial Peach is a nice twist on an old style of beer, but something that maybe is worth having only once.